For some reason, I have been unable to get over to check out the Boccalone Salumeria in the Ferry Building. So I was very excited to hear that they have a mobile panini carrier that goes out to various locations in the city, and the only way to know where is to follow them at twitter.. At last, my long awaited chance to sample the tasty salted pig parts! For those of you who don’t know about Boccalone, it is the creation of Chris Cosentino and Mark Pastore, of Incanto restaurant in San Francisco. Chef Cosentino is the head to tail guru known for coaxing unbelievable texture and flavor from cuts of meat previously regarded as scrap and as a television celebrity from many appearances on the Foodnetwork’s Iron Chef as the ambassador of offal. The demand for the house made salumi led them to expand their operations by taking over a Portuguese sausage making factory in the East Bay where they now produce small batches of handmade artisan cured meats. According to their website, salumi is Italian for the whole family of cured meats, from prosciutto to salami, and also includes fresh sausages and cooked specialties like paté and mortadella. They take the Salumi business very seriously and even have published a manifesto. I loved the idea of the salumi cycle that can only be found by a social networking site. I had been watching @boccalone for nearby drop off points and bingo last week I finally got lucky! Last Friday, Daisy P and I walked over to the Sydney G. Walton park and stood by the fountain at noon. Soon we heard the sound of a bicycle bell… and saw the coolest looking set of wheels gliding down the path towards us. Imagine my surprise to see the delivery fellow, it’s Terry! He used to work at the same company as I. 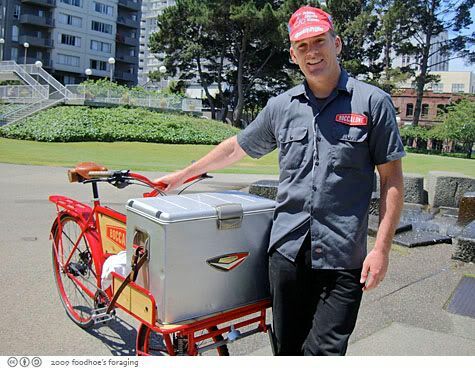 What a cool job, peddling around the city on the handsome SyCip (seesip) designed salumi cycle, pursued by hordes of hungry fans of Tasty Salted Pig Parts. 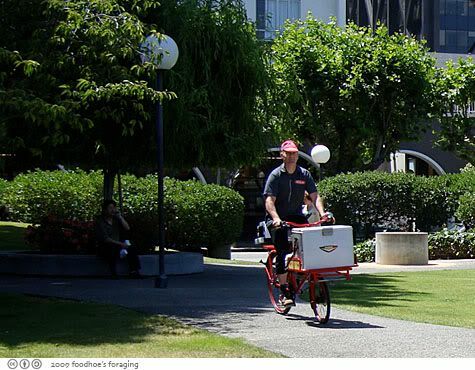 The bright red bicycle is well equipped with a low wide platform to fit the large boccalone cooler. What a remarkable piece of technology. It seemed to be very stable considering the size of the box which was meticulously packed full of panini, sodas and cookies. Here is the Panini ($7). The sandwich was perfectly balanced with thinly sliced salame, a few leaves of peppery arugula and a savory tomato conserva. I loved the simplicity of the sandwich, which I much prefer over ham-fisted piles of meats and cheese slopped with mustard and mayo. The salame was garlicky and meaty and the crusty bread was soft and easy to bite through. 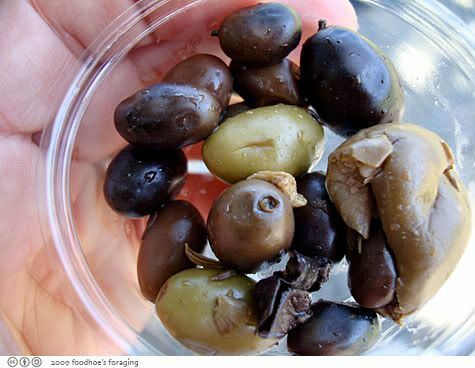 The sandwiches came with an assortment of salty olives. We also got a couple of bags of the Lard Shortbread cookies ($3 for 4 cookies) which is made by Humphry Slocombe (who I hear makes a prosciutto ice cream using products from Boccalone). I like the rustic texture of the cookies, which are enhanced by crunchy grains of cornmeal and bits of rosemary. 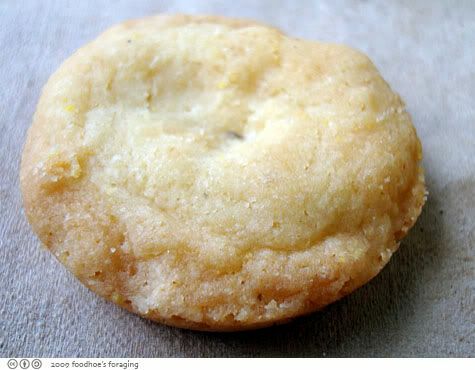 It’s very different from butter based shortbread and tastes a bit greasy but the crumbly texture and rich flavor is very addictive. 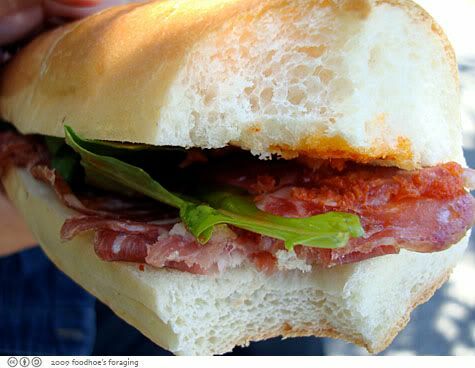 That single sandwich clinched it, I need to make the trip over to the Ferry Building and check out the menu for the full selection of their artisan handmade meats and sandwiches. I’m especially keen on trying the nduja, which is like a spreadable salami and the world famous salumi cone. Oh dang, it’s official. I just became a member of the Salumi Society. Great! That sandwich looks delicious! oooh can’t wait for the nduja as well! That’s so funny that you know the guy who was selling the sandwiches! Now you have an in even before the twitter announcement! 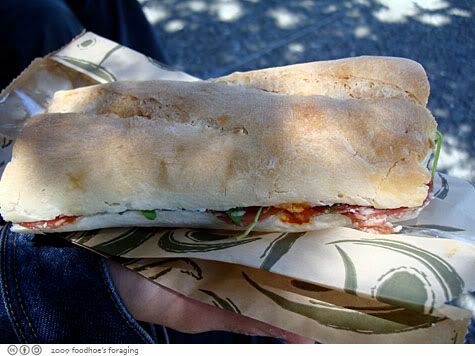 😉 I have to say, I walk by the Boccalone shop at the Ferry Building all the time and have yet to buy a sandwich, mostly because my cholesterol creaks every time I walk by. But one day! single guy, it really was funny. He’s got a great job eh? 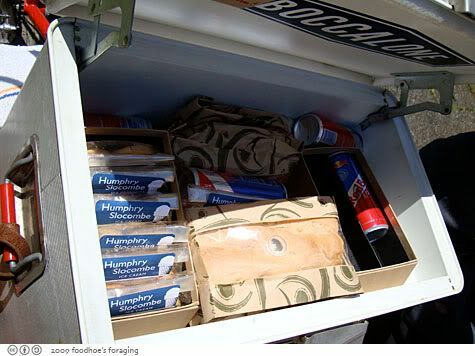 Now I can really get into this kind of “meals on wheels”…..
Just to give you an idea of how obsessive I am, I’ve returned to your blog a few times over the last few days to get another look at that sandwich. Am I crazy or just hungry?! kirk, surely San Diego must have this phenomenon? gastronomer, one of these days! hungry dog, you and me both! How fun to chase the Boccalone cycle down, and to score such a great looking lunch. That’s what I miss about living down in the South Bay. 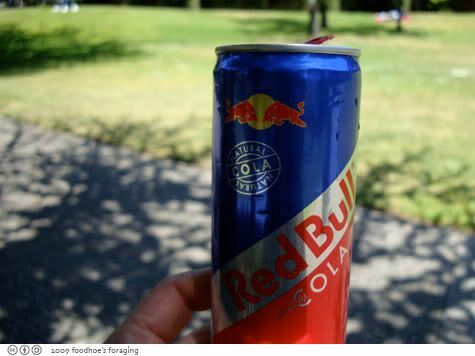 There’s nothing quite so quirky as that to hunt down.